Missing Blinker Handle & Maybe more?? The wires are for cruise control. The same lever also controls the dimmer switch. As bad as that collumn looks I would try to find another one with all the parts. Ermahgerd!!!!! 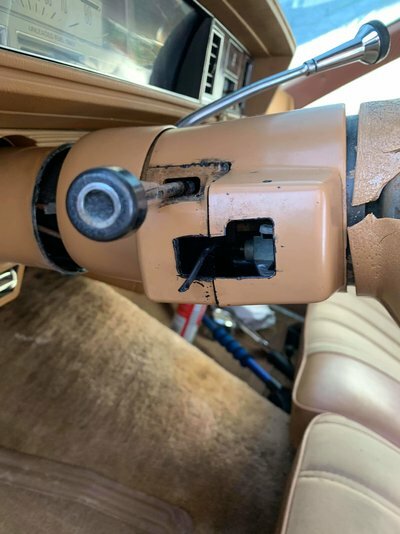 What happened to your steering column housing! Total whack job there! You MIGHT have some issue with the turn signal switch part where it fits in. The original lever has a push fit with an alignment tab. Just be prepared for some damage in there- maybe. There's a reason he wasn't getting a new part. 1) They're discontinued. 2) If you find one, dig deep! Not cheap. Found one on ebay though. Might want to think about getting a kit for that housing. Looks horrible. If you want to consider swapping in another column, I have access to a 78 Cutlass tan column shift tilt column. I'd have to check to make sure that it is tight and I believe it had cruise control but would also have to confirm. Yeah previous owner didn't take care of her at all and broke the bottom ring off the column to hook up the trans shifter I believe. Need to replace the wheel because I'm pretty sure he took it off with a hammer to the backside where that huge crack is because the other side is fine and the wheel isn't bent. Really just needs a lot of love a little epoxy and some touch up paint along with a new steering wheel. If the column does need totally replaced which I don't think is the case I believe I know a local guy that may have a couple complete ones. My current job just cut my hours and let a bunch of people go *yikes* so I'm in the process of moving for a new job with more hours and better pay so I can funnel that cash into the car and assorted other things. If I do replace the entire column it will have to wait until I'm settled and have some more disposable income which is why I'm trying to find a bit cheaper fix for the time being than a column swap I'd love to be able to drive a bit without the fear of being pulled over immediately before a do something major like that where I know the car will be sitting undriveable for a while well I fumble around doing the swap with my limited knowledge and mechanical skills. It's ok to admit limited skills in a particular task. In fact, not admitting it has caused quite a lot of damaged car parts over the years. Don't ask me how I know. Nobody is fluent in everything. If they are, they're a freak of nature and probably needs to be in a Hall of Fame somewhere. But dicking around inside a steering column isn't difficult, but it does require a little finesse in a few spots. Like not overtorquing screws and knowing where and when to pry on something and when not to. Stuff like that. 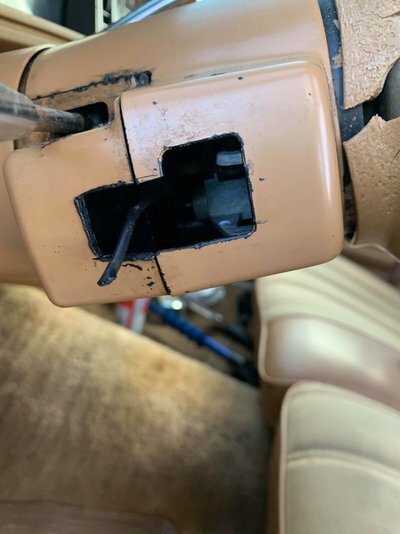 If you have a trusted friend nearby that actually knows how to do a particular task like mucking around inside a steering column, you'll be miles ahead. Or if you were to get a different steering column and replace the entire unit. That's WAY easier than rebuilding one. Check YouTube videos for GM steering column disassembly to get an idea what you'd be getting into if you've never done this sort of work before. Would never discourage anyone from gaining a new skill, but if it's your only mode of transportation I'd hesitate to tear into the column if it's your first time. Good luck with your new job and hopefully you'll be able to fix it soon. Thanks for the words of encouragement 69hurstolds, I've tracked down a handle to install for a little less than the one posted (still alot but what can ya do) but I don't have it in the budget this month for more parts so it will have to wait for May to come around. I did a tear down on the column after watching a bunch of videos and everything is there and in good condition internally but I am considering eventually doing a full column swap after I have the more important items done on the car like finishing the header panel and replacing some engine parts that have worn out from age.